It’s not easy to understand what’s in our body products these days, but it’s important to make sure we aren’t putting potentially hazardous ingredients on our bodies and into the seas and waterways. Every since I was a kid, putting sunscreen on was considered a ‘healthy’ thing to do. Whether I was sailing small sailing dinghies, playing on the beach, or surfing, I was always caked with sunscreen. Like most consumer products, I never questioned its safety for my body or the environment. Sunscreen was something that let me surf longer and captain Swell without getting burned. In 2008, I had a filmmaker on my boat for a week that used only natural soaps, oils, toothpastes, etc, and I started to get curious about what was in the stuff I was using. I was shocked to uncover synthetic chemicals, hormone disruptors, and even plastic in the form of microbeads in some of the products I was using!? I started reading labels and learning more about what some of these hard to pronounce ingredients were. I started choosing natural alternatives to large corporate brands for everything possible. But effective natural sunscreen was still hard to find. I read some studies that linked some of the ingredients of common sunscreens to harmful side effects for my body and for the sea. From health problems, to coral bleaching, to interference with plankton development–the base of the ocean food chain—I realized that the ingredients that I was putting on my body had rippling side effects! Sunscreens basically fall into two categories: mineral and non-mineral. Mineral sunscreens work by sitting on top of the skin, providing a physical barrier between your body and harmful UV rays. Zinc is the primary active ingredient in most mineral sunscreens, and is the safest, most effective sun protection out there. Zinc in its natural form poses no known health or environmental risks. But recently, scientists have engineered tiny molecules of zinc and titanium in ‘nano’ form, which are proven to be problematic…We’ll come back to this in a moment. Non-mineral (aka “chemical”) sunscreens contain synthetic ingredients that are designed to absorb into the skin, allowing them to rub on clear. These make up the bulk of common sunscreens like Coppertone, Sun Bum, Neutrogena, etc. Oxybenzone is a common ingredient in most chemical sunscreen formulations, however, it has been found to pose alarming risks. It is a colorless crystal used in sunscreen to absorb UVA II and UVB rays. In the body, Oxybenzone can enter the bloodstream, disrupting normal hormonal processes. Oxybenzone has been classified as a Category 1 hazard to marine wildlife! When washed into the ocean, it is highly destructive to coral reefs and the delicate ocean ecosystems that depend on them. It’s recently been scientifically proven that this compound inhibits young coral from developing and that even one drop of sunscreen can contaminate the amount of water in 6 Olympic swimming pools!? Other chemicals to be cautious of include: octinoxate, avobenzone, Mexoryl SX, Mexoryle XL, tinosorb, to start. Not to mention that little is known and safety testing is shockingly absent about how these compounds react in our bodies in combination with each other and with skin penetration enhancers. Overall, opt for mineral sunscreens. They provide effective sun protection that’s better for you and better for the environment. What is a nanoparticle? It’s a chemically-manufactured substance that is 100,000 times smaller than the width of a human hair. Nanoparticles exhibit different physical and chemical properties than their larger counterparts and pose potential health risks to humans and to the environment. 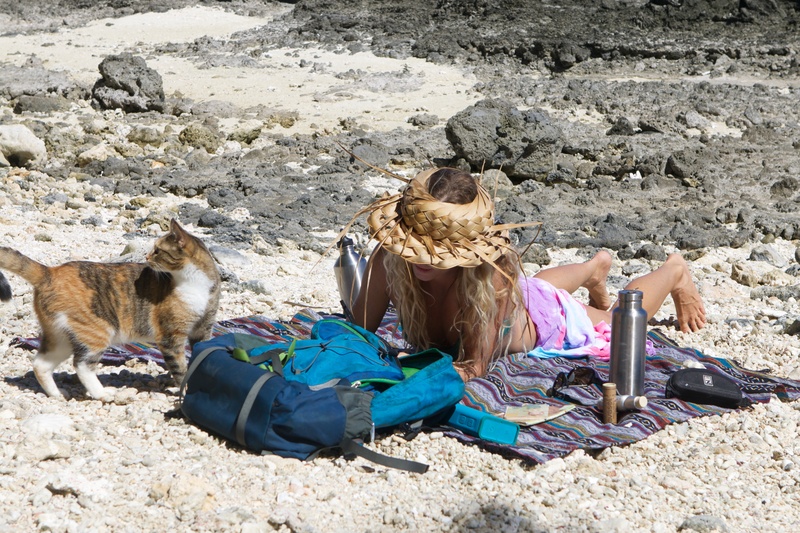 Beach day with Amelia and all the essentials. Protect where you play! It all eventually flows to the ocean, so using reef and body safe sunscreen benefits you and the ocean no matter where you live. Ingredients in common sunscreens have been found to inhibit coral and plankton embryos from developing properly. One drop of sunscreen can contaminate enough ocean water to fill 6 Olympic swimming pools! The use of spray sunscreen is also cause for concern. Spray sunscreen is conveniently applied through an aerosol application. But this application can spread those nanoparticles and chemicals into the air, putting you at risk of inhaling them. Nanoparticles have been linked to have damaging effects on the lungs and intestinal tracts. Once inhaled, these are so small that they interfere with your body’s normal biological chemistry and can cause complication such as infection, or even the growth of cancer cells. When applying spray sunscreen make sure to hold your breath to avoid inhaling the chemicals, but it’s probably better to avoid the risk altogether. The long-term health risks of nanoparticle use in humans remain poorly understood. There hasn’t been enough research done to truly know the degree to which these nano-scale particles are penetrating our skin and interacting with our cells, tissues and organs. What has been thoroughly studied, however, is the effect nanoparticles have on the earth’s ecosystems. Recent bodies of research have shown that the release of these ultra-small particles into the environment accumulates as toxic pollutants in air, soil or water. At the beach or lake or river, people cool off by taking a dip and their sunscreen washes off into the water polluting it with toxic chemical compounds and/or nanoparticles. Since everything flows to the ocean and since these particles are too small to filter out, you don’t need to even be in the ocean to pollute it–just taking a shower at home can do it. Sunscreen nanoparticles have been shown to be toxic to the base of the ocean food chain by damaging and disrupting the immune systems of phytoplankton and marine creature embryos. As the bottom of the food chain becomes compromised, this creates a butterfly effect up the food chain from algae to fish to dolphins to whales. A white sea urchin embryo that was exposed to nontoxic levels of nano-zinc oxide. The green dye shows that other toxins are retained when exposed to nanoparticles. Click here to read more. Sunscreen companies are aware of these studies and consumers educated on the issue have raised significant and valid concerns. As a result, manufacturers have begun clumping up a bunch of nanoparticles together and calling the formulation ‘non-nano.’ These claims are misleading, as this is a superficial attempt to disguise the true nature of a product. They key is to find products that contain solid-particle, non-nano zinc oxide. Unfortunately, nanoparticles are currently not regulated by the US FDA as they are in other countries, so it is not likely we as consumers in the US will be able to find adequate information about these ingredients on product labels. My mini sea sisters, Heimiti, Vahine, & Kohai doing their pre-surf Avasol rituals to protect their skin and love their reefs at the same time!! Any time you see a formula that rubs on clear, it is going to either contain UV-absorbing actives like Oxybenzone, a chemical known to interact with human bodily processes and damage coral reefs, or if it’s a mineral formula, will contain nanoparticles, the side-effects of which are murky. I’ve decided that the mild appearance of a physical sunscreen (the tan color on my skin) and the slight additional cost of all-natural, 100% bio-based, mineral ingredients far outweigh the risk in buying a cheap, corner-cutting sunscreen with unknown long-term risks. For those of us dedicated to making healthy decisions for our bodies, families, and the environment, I encourage you to protect yourself from the sun with shirts and hats when possible, and ask questions and do your research when choosing a sunscreen. It has been such a pleasure for me to get to know Chris and Lisa of Avasol Suncare over the last few years. It’s so rare to meet people so dedicated to sustainability, accountability, and responsible business. Every ingredient is researched carefully, sourced responsibly, tested extensively, and combined with love to make sunscreens that actually make my skin feel happy when I put them on! Avasol ticks all my boxes for personal and environmental safety, plus the packaging is 90% less plastic than most brands. The epic face stick they make comes in a 100% biodegradable, recycled paper tube that’s waxed for water resistance! In this world where the consumer constantly feels like they have to be on-guard, I feel so lucky to know that there are people like the Wilkinson’s, trying to do the right thing for the right reasons. Order some today at Avasol.com! For international inquiries, email info@avasol.com. 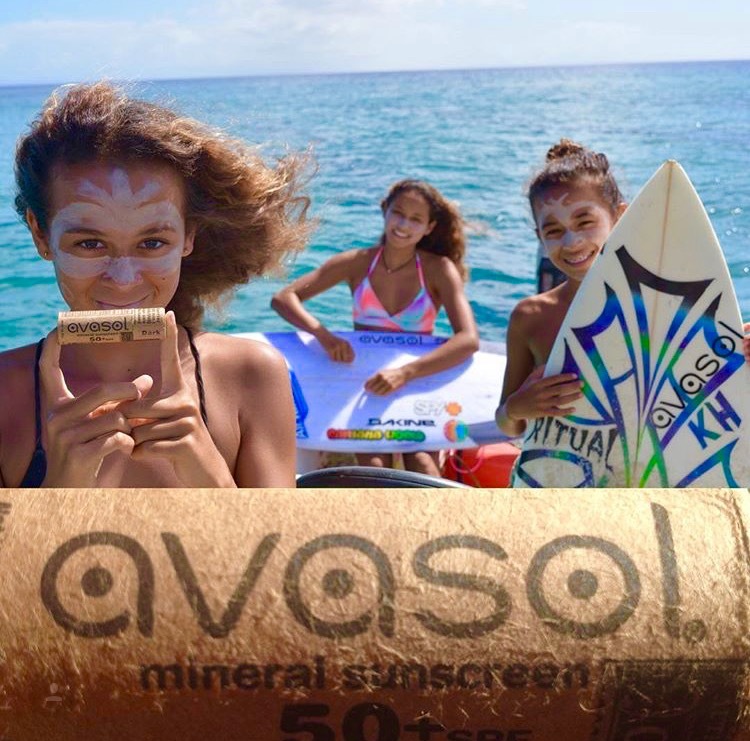 Avasol is the most effective, conscious, versatile solution for ‘safe’ sunscreen that I know of! Order at Avasol.com. 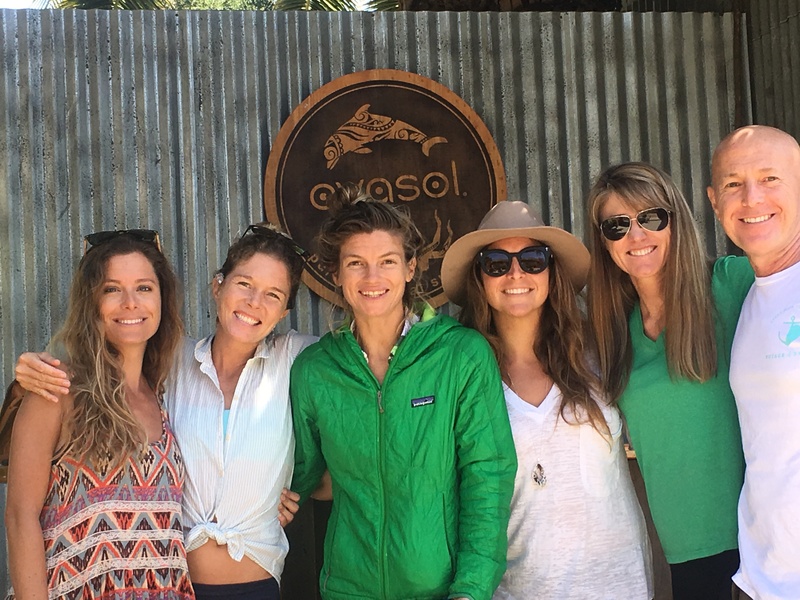 Gathering of sea sisters at the Avasol headquarters in Santa Barbara. Lisa and Chris Wilkinson created Avasol out of passion and persistence, right in their own backyard. They are on the far right! Hello! We are Belgian citizen working mostly in the summer season in fire fighting. We are all most interested in using your AVASOL products; is AVASOL delivering their products in Europe or can we order only within the US? the Problem is that we are not working in USA but in Europe, Asia and in some parts of Africa. We thank you for the quality of your study and hope to be in touch very soon! Email info@avasol.com to make international orders! fruits, you didn’t mention them but I assume you eat lots of fresh raw fruits. Grains? Aloha, Steph. You are an inspiration to me as I start to embark on a sailing journey similar to yours. I have had three Basal Cell Carcinomas removed from my face in the past three years. Skin cancer runs on both my Mother and Father’s side, and unfortunately dealing biopsies and surgery is as regular as going to the dentist, for most of my family. Although, my doctor says, “If your going to have cancer, the best one to have is Basal Cell (Carcinoma)…” because it is 99% curable. The financial expense of MOHs surgery (me, without health insurance), and amount of skin that is taken is a bigger chunk than you would imagine! Literally and figuratively. The spots that develop on the rest of our body isn’t fun either…creams, nitrogen, scalpels, ouch! Growing up in Florida, then continuing my life on boats, most of the damage occurred in my youth and early 20’s. 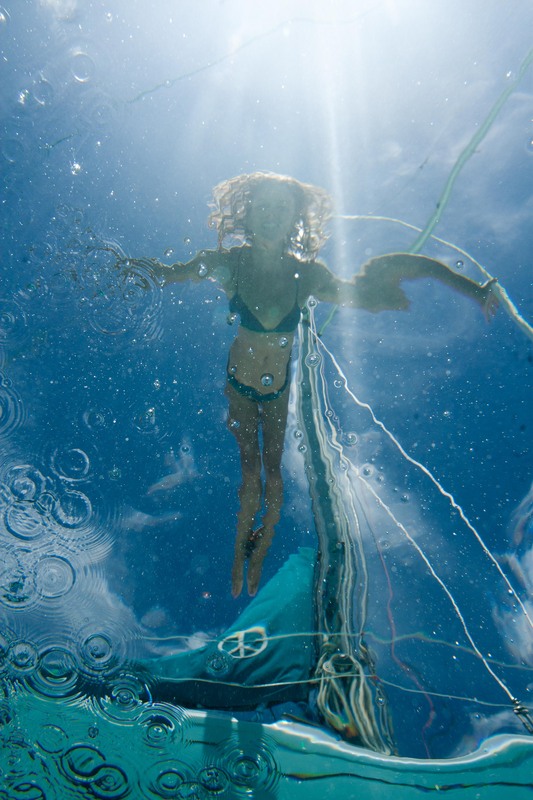 I find guarding myself from the dangerous rays a constant battle, especially because I work on the water. I find my self using physical methods of sunscreen as often as possible; hats with capes, sun sleeves, long shirts, gloves. I have been on the search for a non-toxic sunscreen that does the job, has staying power, and doesn’t promote acne. Ingredient lists are confusing, and it seems the most toxic sunscreens are less expensive and more readily accessible to consumers. Research and awareness are critical, and fortunately there quite a few websites and apps out there to help. Thank you for sharing your findings and research! Great stories and fantastic blog! We operate an sailing tour company in Barcelona Spain and were also not aware of the impact sunscreen has on the body and environment. This year we will go all electric with our boat and we are excited about that. Can I take a summery of your blog with a reference to our site, advising our customers of the affects of sunscreen? Yes, of course!! Thank you!! Liz, thanks for the sunscreen info. supplements specifically you end up taking.